Unless your business focuses on a very specific niche audience, chances are your goal is to reach the broadest possible range of people with your products and services. 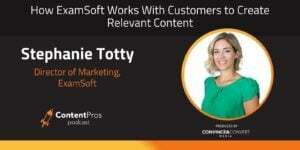 This can be an overwhelming challenge when trying to engage with multiple unique demographics in your consumer base, but Stephanie Totty of ExamSoft has a brilliant solution: let your customers create the content they want to see. By fostering a passionate ambassador program, as well as paying those ambassadors for their content, she’s shown how customer-generated content can be an invaluable marketing tool as well as a perfect way to keep current customers engaged. From writing blog posts to speaking at conferences, nothing is more powerful than a customer becoming a real advocate for your business among their peers. While she wishes she could say far in advance, Stephanie holds the tradition of starting her holiday shopping on Black Friday. She’s also a big fan of Amazon Prime! 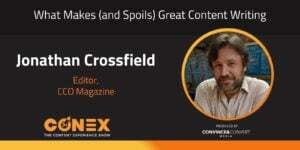 Randy Frisch: Welcome to The Content Pro's Podcast. I'm Randy Frisch from Uberflip. I've got Tyler Lessard from Vidyard as my cohost here. And today we're gonna dive into, perhaps the part that goes way beyond content, which is a part that content lives in, which is the customer journey. What are those various steps that we have to map as marketers to figure out that first point of awareness and engagement all the way through to that person becoming a customer and potentially even an advocate. And one of the things that I talk a lot about at Uberflip with my team is that we've got to think about all the various channels that we're using to engage with people and make sure they overlap, and then infuse that with content. Because people are looking for content in every way they engage these days and I know, Tyler, for your team that's a big aspect of how you go to market as well. Tyler Lassard: Yeah, absolutely. We all know the value of content and what it can serve throughout the buyers' journey, but for a lot of us I think it's easier said than done. We all think about what do we need at different stages and how do we support that buyers' journey with content but it's really different to get down to it and say, how do I really address those needs? Not just the top of the funnel but all the way through that selling process. Super excited to have Stephanie Totty here with us today, Director of Marketing from ExamSoft to talk a little bit about that and their content strategy. And I think Stefanie, your team has done some pretty remarkable things given that you've got a number of different unique audiences you need to serve, dare I say personas, that I think have very different needs, very different expectations. But I think your team has done a great job focusing in on the kinds of content you're serving up and then how you're delivering not only to one persona throughout the journey, but multiple. With that, maybe you could quickly introduce yourself and talk a little bit about what you've been up to and your background at ExamSoft. Stephanie Totty: Yeah, absolutely, thank you so much for having me. I'm Stephanie Totty. I'm the Director of Marketing for ExamSoft. I've been with ExamSoft for about five years now and I think everybody feels like they have a very specific or niche audience that they're working with when you're in the B to B world. But, ExamSoft caters to higher education. We're an assessment software that can be used at whatever level of education you would want. But specifically we cater to graduate level, professional programs. Law schools, medical schools, pharmacy, nursing, health sciences, a smattering of undergraduate programs and private K12, but for the most part we're working with the graduate level professional programs. When we started really working on our customer journey and creating the content to go along with that customer journey, we had to think about: a, all of the different disciplines that we cater to because obviously our messaging, our content when we're talking to somebody within a nursing education program is very different than what it would be for a legal education program. And then within each discipline we cater to, we have to think about our personas. Again, if we're looking at a nursing school versus a law school, how I speak to the IT Director for a nursing school would be very different than how I speak to a faculty member, et cetera. And then obviously within each persona then you have all these different pain points because maybe the IT Director at nursing school A, their pain point is different than nursing school B. You can see where this gets super granular, super quick. And it was very important to us that we have content that speaks to the benefits of our software for every single different spoke on that map. So we went through and just made spreadsheets on spreadsheets on spreadsheets of, for this discipline and these roles and for these pain points, this is our messaging and these are the four different pieces of content that we either have or need to create for each one of those pain points that map to a persona that maps to a discipline, et cetera. And so we wanted to make sure we had a video, and a blog post, and a PDF one pager, or a downloadable e-reader that we could have for every single one of those pain points to map back. And also, once you get through with that first level, you're also thinking about, once they get post demo, which is kind of like for us that big threshold and when we're passing off to outside sales, our content obviously changes. Our messaging changes. What our prospective clients are interested in learning at that point changes. So then we have to create this whole nother layer of content that speaks to them as well. So, we have a lot of content. Tyler Lassard: So it's a good thing your marketing team is 150, 200 people, is that right? Stephanie Totty: No, there's seven of us. That includes our VP of marketing. So we're super busy and we create a lot of content. But a big portion of our content creation strategy actually utilizes our actual clients. Our ambassador, or market term would be client evangelist, we call them ambassadors, is so incredibly important to us. I've spent the last five years growing and maintaining that program. It used to be where I would call up the dean of a medical school and get hung up on and now I have people knocking on my doors, really wanting to work with us. Because it's beneficial for them, as well, in several different ways. But we honestly rely on our clients a lot to help us create and then distribute that content. Randy Frisch: That's really interesting. Can you tell us a little bit more specifically what you mean by that? Like are they fueling you with ideas for content, or are they actually writing a post for you and have you given them access to do that with certain guidelines? How do you manage that, because that seems like an amazing blessing to have, but I'm sure a lot of us would be like, oh I'd be a little worried to let them free in there. Stephanie Totty: Well we don't actually let them loose inside any of our softwares or programs. Like we don't put them in Uberflip and say, hey create a blog post here. Not like that, that could get messy super fast. I have, at this moment in time, about 80 active client ambassadors. They are from all different educational disciplines. They are all different roles. And I let them do as little or as much as they want. I have some ambassadors who are actively on the phone with me and saying, hey I came up with this really great new idea. I would love to do a video, or I would love to write a blog post, or I want to speak at this conference, would you support that. Who are actively working with me and giving me new ideas. And then I have ambassadors who are really great at actually hosting a webinar or speaking at a conference or writing a research paper, but I really have to put that idea in front of them and push them to create for me. And some of them do one project a year, some of them do 17 projects a year. It really just depends. I let them decide how involved they wanna be, because obviously I know they have a quote normal full-time regular job as well. Probably several. So I let them be as active or inactive as they want. I do compensate them for their work as well, which is a big motivator for a lot of them. It's a little side gig that they take too, and that they really like, some of them, they really enjoy doing. And it's good professional advancement for them as well.. Academics are expected to create and maintain what they call scholarly activities to add to their CV and this is a really great opportunity to both satisfy that requirement as part of their job and then also make a little side money and work with a company they like. Randy Frisch: I think that's a great idea. How much of your content has become generated by these ambassadors versus created by your lean team of seven? Stephanie Totty: Well 100% of our webinars. So we do anywhere from one to four webinars a month. And honestly, it's as many as I can book. So if I can book four in a month, I'll do four. If I only can get one, you know sometimes the year's more busy for academics than others obviously, and nobody's in the office in December so I don't usually book anything in December. Every single webinar that we host is presented by an ambassador, by a client. We don't do any of that content ourselves, so that's all created by them. Blog posts, our written content, is usually like 50 50. I have some that are really engaged, really like writing. And I'll also play to their strengths. So if I know somebody isn't a really great speaker and is gonna get nervous and is not gonna be the best fit for maybe presenting at an educational conference, but they love writing, we'll play to those strengths and so I'll have them write a couple blog posts for me. Just depends. Randy Frisch: That's great. So I'm curious, let's dig in on the webinar and tie this back to the customer journey perhaps. 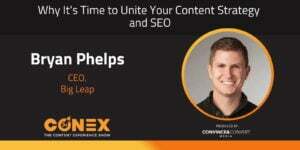 It sounds like you've really adopted webinars as a big part of your content strategy. I assume running them, you're able to generate leads. I assume that they act as part of the library that you have and you probably can serve them up in a really good video tool that you may have, but where does this map to your customer journey? Is the webinar where you meet your audience for the first time or is it something that moves them along that journey? How do you think about that? Stephanie Totty: Webinars specifically are really great for us because we cater to academia, because what is it, right? It's usually a 30 to 60 minute presentation. It's a lecture. It's a content form that they're familiar with and that they're used to digesting. It works at all levels of our funnel. It's searchable. We use VidYard, so it's really great for ... We store all the webinars there and then we get them onto our our resources hub. It's really great for the brand new people to find us and enter into that funnel. It's a great legion source. And then it also works for, well we found through our sales' initial phone call or during the demo that our prospective client is really interested in this pain point topic. So then we've got ... I mean we have hundreds of them, hundreds. Like a whole library of client created academics, people that will resonated with them, telling them how they use our software actually to affect positive change within their programs. And it's in a content form that they're used to and that they understand and that will work for them. And so` we can just send them a link and it's great. It's also really great for current clients, right? So this is just a library to send to clients who ... They're using our platform but they're not doing everything that maybe they could be doing with it. They really want to take that next step. So here's four resources, here's four lectures, on how other med schools are really going above and beyond with using our software to affect change. It's throughout the entire customer journey and beyond. It's great content. Tyler Lassard: Yeah I love that point there of really aligning to the expectations of your audience. We do webinars as well. But in our market, we're serving marketing and sales teams and we've actually found a lot more success with shorter webinars because their expectations are different and what they're looking for tends to be a little bit different. So it was really interesting when we started doing and promoting some of our webinars as 10 minute, or we do webinars with Jay Baer, where it's a nine minute webinar and we've seen really great success with that. And I think the webinar is a format that works. People sort of understand the expectation. It's an opportunity to engage with somebody who's a thought leader. But finding that right kind of style, maybe even that right length, the right format for it might depend on your audience, and there's lots of different ways that you can do that. The one other thing, and I'm curious what you guys do ... I always find the webinars are the gifts that keep on giving. And to your point, you can use them at various points in the customer journey, we do the same thing where they're promoted maybe through some third party channels for new legion. They're promoted into our existing base as a nurture tool and to your point, we'll track who actually watches, how long they engage, and use that to fuel our nurture programs and our sales development. And there are things that our sales team shares with people as kind of no ask touches where they'll go out and say, hey we've got this great webinar on this topic. I'm not asking for anything of you, I just thought you might find it helpful. And then we repurpose them in blog posts and lots of other ways. And I love them from that perspective. I'm curious if you guys do different things with your webinars, rather than just sort of a one and done. You touched on kind of using them, but do you use them in blog posts? Do you use them in other ways? Stephanie Totty: Yeah. They get repurposed in several different ways. They get repurposed to blog posts. We have a couple of gung ho ambassadors who really like working with video who actually will redo them for us in more bite size chunks. I've got a couple ambassadors who just will say, hey I know I've recorded this 45 minute webinar for you but I would really like to do just a quick video of me going through the key points and do it in less than 10 minutes. So we have several that are broken up in that type of format. Webinars are honestly a really good way for me to vet my ambassadors' speaking performance. So, as much as I love webinars, where we really see our ambassadors shine is when they speak at conferences on our behalf. So, they'll submit an abstract for an educational conference that, if it has anything to do with either our software or data that they've extracted from our software, affected teaching and learning, they'll submit an abstract and if they get accepted, we'll support them financially to attend that conference. But obviously if I'm going to pony up the budget for something like that, I wanna make sure that they're going to be an engaging speaker and that the messaging that they're actually sending out there is something that would be beneficial for ExamSoft. So, I use them in a number of different ways, everything from vetting my ambassadors, speaking techniques and content, to repurposing in different formats in different types of consumables. Tyler Lassard: I love it. I love this whole topic of user generated content and leveraging the community to create great content. It's something we've touched a few times here on Content Pros. It's just such a scalable way. But I also think it's a great way to create super authentic content right from the market that's pure validated. One question on that is, what have you found to be successful in helping you build out that community of advocates? You mentioned you guys have the ability to do some incentives and things like that, but if you look back and think about what you did. Was it just being disciplined about building that community, building the relationships, or were there any tips and tricks you can share with people that are thinking about doing the same kind of thing? Stephanie Totty: I would say the number one reason our ambassador program has been so successful is that I compensate them. That I'm not asking them to do work for free. I mean it is work. For them to take time off of work to go speak at a conference. Or for them to go put together a presentation and then provide a webinar. For them to write a 600 to 1000 word blog post and gosh, for sure, if they're going to be drafting an actual research paper, which could be 15 pages long. That's actual work and so I feel very strongly as a professional and as a content creator myself, that nobody should work for free. Especially if someone else is benefiting from that work. I mean this is evergreen content that's gonna live on ExamSoft's website forever. And we're gonna get use out of it for years and years and years. We're gonna repurpose it, we're gonna gate it, we're gonna use it in emails and other forms of legion and we're gonna reap all the benefits. The creator should be compensated for that. I find that my ambassadors, as soon as they understand that I value them as both an educator and a professional in their field and, money talks. I really feel like the personal connections that I've created with all of them, which I have and it's taken a really long time, that those only go so far. But that fact that I show my appreciation and how much I value their work monetarily, speaks volumes to them. Randy Frisch: That means a lot. It sounds like you've built a real relationship with your audience, which is something we say all the time. But I think you've done so in a really unique way, Stephanie, so kudos to you on that. I wanna dig more into some of this webinar stuff, too. But before we do that, we're gonna take a quick pause here from the podcast, hear from a couple of our sponsors. Both of which you use, being Uberflip and VidYard and then we'll come back and talk about gating some of these assets, which you touched on along the way. We're back here on Content Pros with Stephanie Totty, and we've been talking a lot about the customer journey and about the different types of content. 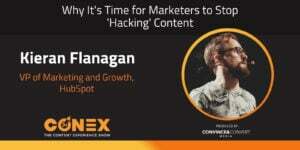 And one of the ideas that seems to be working really well for you both through using your ambassadors as well as format for content that, as we said, keeps giving, is the webinar. And along one of your answers, you talked about that you would gate them a lot during the customer journey and I'm wondering what your stance is on gating. I know I found some of your on demand webinars on your resource hub, which sit there ungated. It's more of a passive gate, that if you want to opt in to, say, a demo of ExamSoft, or just subscribe to more content than you can do so ... how do you decide when to gate different assets, at what stage? Stephanie Totty: That's such a good question. And full disclosure, I am not sure that I am the best person to advocate for gating content and I know that goes against everything a content marketer is supposed to believe and practice. We do gate some of our content. All of our content is housed within our Uberflip resources hub. And so what I do is, usually once a quarter, I will go in and will pull the reports that Uberflip provides us on what pieces of content within each stream are performing the best, and generally those are the pieces of content that I will gate. So it's different depending on which stream you're in, as to what's gonna be gated and what's not gonna be gated. I can't tell you how many times we've sat around the boardroom table within the marketing department and just argued back and forth on yes, we should gate everything, we should be taking an email address from everybody to no, we should be making sure our content is available, we don't want to turn people away, we want it to be consumable for everybody. I will say that especially with our videos, one of the really great things that we love about VidYard is that if we already have that person's information within the system, we know who's watching our videos. Which was one of the huge motivators for us signing up with them. If I know that Dr. Jane Smith from Yale Nursing whatever, is watching my videos, and I know that all three of those videos are on a specific topic, I know that I can pass that information off to my inside team and that they're going to email her and engage her in that specific topic. Randy Frisch: That makes a lot of sense. That's the value of insight and knowing what's working and plays back to everything you're talking about on these debates, right? That's the power of having all this data, I suppose. But going back to something that you and Tyler were saying earlier, is that the customer journey is not linear. It's not the same for everyone. And that's why a lot of us debate it so much because what worked for one person or when they used an asset along the journey, may change from one person to the next. Stephanie Totty: Right. We have so many different contacts that end up as an opportunity influencer. And so we're gonna have content that is digested by one contact that is associated with an opportunity that is gonna be completely different from what another influencer with an opportunity is interested in. So somebody's gonna drop off the face of the map, or we're gonna get through a demo and then they're all gonna drop off the face of the map, and then we have to find a way to re-engage them, right? So if we can collect that information about what contact A versus contact B versus contact C was interested in, we can go back then and continuously re-engage them with the correct type of content. If I know that contact A is only interested in security benefits and they're an avid video watcher, then that's what I'm gonna send them. That's what I'm gonna tell my inside sales team to send them. If contact B has been all over content regarding learning outcomes, then that's what I'm going to send them. So being able to track all of those different things and getting it in front of my sales team is so, so, so important. Tyler Lassard: It's one of the things that I've found is interesting about the use of content and I try to instill within our team, is that it's not just a lead generation mechanism. We gotta be careful about not just turning it into clickbait, if you will. But that to me, a lot more of the value is in that lead nurturing, that education through the buyers' journey. And then using the insights to help qualify and understand the buyers better. And that's why I love so much these ideas of being able to track actual engagement, whether it's an e-book or a customer story or a video, or a webinar. Because I'd rather focus on serving up content that's gonna help me better understand my buyers than I am as something to try to get their ... I mean getting their email address is great, let's be honest, we all have to generate leads. But I think it's missed opportunity for a lot of people who don't think about that idea of how can I use content specifically to not only nurture my base, but to better understand them. To learn what they're engaging in, how long they're engaging in different types of content and use those insights to build a more efficient marketing and sales engine. And I think that's a big future of content, personally, is that notion and that idea of the value of the insights and how it can help us be better marketers and better sales team. Stephanie Totty: If it was easy as just getting the email address, our jobs as marketers would be a thousand times easier, right? If that was all that went into this, absolutely. I'll write blog posts and clickbait all day long to grab email addresses. But what it comes down to is, my job is to make sales' job easier. If I'm creating content around specific topics or pain points because our software is so robust and there's so many different reasons why people would be interested in it ... If I can figure out what that interest is and get that to my sales guys ahead of time so that they can then personalize the demo to that contact, to be specific to what they're looking for. That makes their job easier. It makes my life easier in the long run because they're gonna get through way more demos and be more successful in getting contracts signed. Randy Frisch: Wow, that sounds like what every sales person wants to hear. You just preached to every salesperson out there I think. Stephanie Totty: We have a really good relationship with our sales team. I feel like I talk to other marketers and it's the old adage, sales versus marketing, who's at fault for not hitting numbers, who wants what. That's honestly not my experience here at ExamSoft. We work very closely with our sales team and honestly, the marketing team, we feel like we are a mini agency. The seven of us are a little bitty agency and that all we are here to do is to make sales' lives easier. Whatever resources they need to schedule demos and get contracts signed, that's what we will do. We very, very rarely say no to anything they ask for. Tyler Lassard: To bring that full circle back to the topic we were focusing on, I think having that buyers' journey and the customer journey centric mindset as a marketing team goes such a long way with driving that sales and marketing alignment. Because I think that not enough people spend enough time, like you talked about Stephanie, just grueling it out with the spreadsheets and going, who are we really targeting, what do we need at each stage? Not just the top of the funnel but at each stage of the buyers' journey and then getting buy in and alignment with the sales team that these are the right messages, that this is the right content, and taking that kind of approach. As opposed to, what I think that many marketers do, which is take a very top of the funnel approach to saying, I'm gonna do things that are gonna generate the most inbound interest and then I'm going to hand the lead over to sales and let them take it from there. I think there's a lot of intersection with these ideas and it's something that I've found that ... And also within our team we've really built good marketing and sales relationships and I think it's back to that relationship of having that full funnel mentality and how can you help sales, not only with a new lead, but how your content strategies help progress deals, nurture deals, and ultimately close them. Randy Frisch: Well guys, we're running low on time here, but Stephanie, at the end we always like to get to know our guest outside and I've been trying to think what to ask you because both of us work with you through our companies. But usually I'm not supposed to do this with content because we talked about using webinars or using podcasts over and over, but I'm gonna date this podcast a bit by saying ... We're leading into the holiday season, right? And so my segue here is, you just talked about all the gifts that you give to the sales team. You're there gifting whatever they need. When do you, and Tyler, you can jump in here too, when do each of you start to do your holiday shopping. Because we're closing in and the big question is when does that start for you, what's the trigger date? Stephanie Totty: I wish that I could say that I started my holiday shopping months ago, but that would be a big fat lie. For me and my family, I am one of those ridiculous Americans who like, Black Friday is when ... We have Thanksgiving on Thursday and then that night, I start shopping. It's when all the quote good sales are and it's kind of tradition at this point. So that's when I start my shopping craziness. Tyler Lassard: I hate to admit it, but I am such a last minute guy when it comes to this and I usually wait until there's a good layer of snow on the ground up here in Toronto before I get my head wrapped around the holidays. It'll probably still be a couple of weeks before it registers in my mind. Randy Frisch: I think we're all, just to be called Generation Amazon. Right, it's just you have the mindset ... it's my kid's birthday this week and my wife and I are like, so what can Prime deliver overnight? What can we get and will they gift wrap it? Stephanie Totty: That is absolutely a thing. I have two kids myself and yeah, Amazon Prime for the win. Randy Frisch: Absolutely. Couldn't agree more. Well, Stephanie, thanks so much for joining us on Content Pros. Ton of fun talking to you and understanding how you think of the entire customer journey and really how content's bing mapped there. And I think that's the key takeaway for a lot of us is ... As you said, you didn't necessarily even do it in the most overly cumbersome way, you started with spreadsheets. You mapped the key pieces of content you needed and you accomplished this with a really lean team to accomplish amazing things at ExamSoft over the last five plus years. Kudos to you and your team and on behalf of Tyler and myself, thank you so much for joining. For those listening in to the podcast, you can find all of our other episodes at contentprospodcast.com. We're also on iTunes and Google Play, Stitcher. Wherever you find your podcasts, be sure to find this one, and please let us know what we can do better. Until next time, this is the Content Pros podcast.